What does measles actually do, and should you vaccinate against it? Or is this just hysteria? Measles is a virus: a hull of proteins, RNA, plus some more proteins for reproduction. It cannot reproduce by itself; it needs a host cell to do so. To understand measles, we have to understand the immune system. You might already have seen the visual system we developed to help here. Now, let’s focus on the parts of the immune system relevant to measles. The measles virus enters humans through the nose, mouth, or eyes. The measles infection starts in the lungs. Measles is especially good at infecting the body’s first line of defence: macrophages, powerful guard cells that protect the lungs from intruders. They enter a cell and take it over. The virus reprograms the cell and transforms it into a dangerous virus production center. Once a cell is filled with viruses, they leave the crippled cell and begin the cycle over again. But the immune system has powerful weapons against virus infections: natural killer cells. These cells basically patrol the body and check other cells for infections. If they find an infected cell, they order it to commit suicide. This is so effective that for the first 10 days or so, you will not even notice that you’re infected with measles. And now, the reason why measles is so powerful. After a period of fighting and dying, macrophages alert the brain of the immune system: the dendritic cells. The job of the dendritic cells is to collect samples of intruders, travel to the lymph nodes, and then activate the heavy weapons that eradicate the infection very fast in a team effort. But the measles virus uses a dreadful tactic. It infects the dendritic cells and uses them as a Trojan horse to enter deeper into the body. The infected cells travel to the next lymph node to alert other immune cells. Once it arrives, the measles virus spreads around the virgin T and B cells and infects them. It attacks the very system that evolved to fight it. Now, things happen very fast. The lymph system spreads the virus everywhere and it enters the bloodstream, infecting cells while traveling. Measles infects organs like the spleen, the liver, the intestines, and, most importantly, the lungs. The symptoms range from a very high fever, headache, sickness, bronchitis, and, of course, a rash. In the lungs, the immune system was doing pretty okay. But now, millions of viruses attack a second time and kill countless cells, wiping out the defense systems. In this phase, you start coughing out millions of measles viruses. Measles is so contagious at this stage, that if you meet someone who isn’t vaccinated, there’s about a 90% chance you’ll infect them. Without the protective army in the lungs, other bacteria or viruses that would usually not stand a chance can now enter the lungs and develop into harmful parallel infections that can cause pneumonia, the most common way to die from measles. Your body’s immune system is now seriously wounded. Various protective systems are hurt and disrupted. The virus spreads everywhere, infecting the skin all over the body. The typical measles rash now becomes visible. And in some cases, the measles virus reaches the brain and causes a brain infection. If it does so, the chances of dying are between 20 to 40 percent, and there may be long-term damage. But your body is far from giving up at this stage, and it fights back agressively. Some dendritic cells survive long enough to activate the anti-virus forces of the body. Plasma cells in the lymph nodes start producing billions of antibodies, tiny proteins that mark infected cells for destruction or clump the virus together. Killer T cells flood the body and kill infected cells left and right. After 2 to 3 weeks, the body usually gets the upper hand and overwhelms the infection. But the immune system is now seriously weakened, and may take weeks or months to recover, leaving the body vulnerable to other diseases. But, if you make it, you are now immune: the immune system remembers the virus forever. Measles is no joke. Although 84% of all humans are vaccinated against measles, 122,000 people died because of the infection in 2014. Some people cannot get vaccinations, either because they’re too young, because of chemotherapy or HIV, or because they’re allergic to the vaccine. They need the rest of us to stop the disease for them. The measles vaccination is safe, cheap, and available. 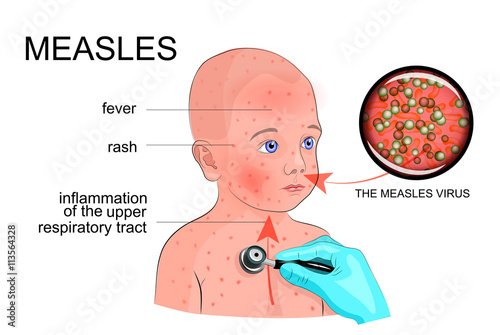 There are no benifits from having measles at all. You don’t strengthen your immune system and it’s not more natural. Most people who don’t vaccinate only want the best for their children, which is honorable. But if you ask yourself, “Am I putting the life of my child and other children at risk by not vaccinating against measles?” The sad answer is yes. Yes, you are. Let’s not play the blame game, though. Let’s work together and eradicate this virus. Together, we can get rid of these dreadful monsters and consign them to their rightful place: the history books. Subtitles by the Amara.org community.